BELIZE CITY, Fri. June 29, 2018– The owners of Titan International Securities, Bahamians Kelvin Leach and Rohn Knowles, have been in a protracted legal battle with the Government of Belize that finally made its way to the highest court, when the Caribbean Court of Justice heard their appeal today at the seat of its headquarters in Port of Spain, Trinidad. Titan International Securities, which was located in the Matalon Building on Coney Drive in Belize City, was shut down by Belizean law enforcement agencies, acting in coordination with US law enforcement agencies, almost four years ago. Both Leach and Knowles, and three others who were connected with the company’s operations, were indicted in the United States on charges of securities fraud, and the US had issued an extradition request to the Belize government for them in September 2014. Police then raided their offices, taking away all computer equipment and files, and placed the two under arrest, pending an extradition hearing. 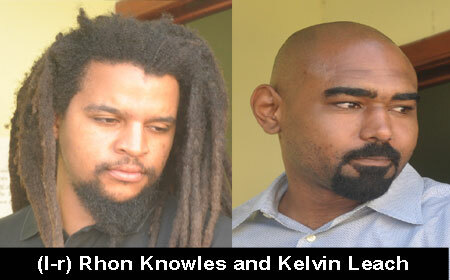 The extradition arrest procedure was botched, however, and Leach and Knowles were offered bail by Supreme Court Justice Denis Hanomansingh. They later filed a lawsuit against the Government of Belize in the Supreme Court for excessive search and seizure and Justice Courtenay Abel ruled in their favor and ordered that the government pay them $8 million in compensatory damage. The government appealed the Supreme Court’s award and the Belize Court of Appeal agreed that the search and seizure were excessive, but the court set aside the $8 million compensatory damage awarded by the lower court. Leach and Knowles, however, appealed the Court of Appeal judgment to the CCJ. At the CCJ, Leach and Knowles were represented by attorney Eamon Courtenay, S.C., who told the court that when the raid was conducted, Titan had no ability to contact its clients. Solicitor General, Nigel Hawke appeared on behalf of the government, arguing that the destruction of the company was actually caused by their suspension, which put a halt to their operations. The appellants are asserting that it was the search that impacted the business. What really caused the cancer of the company was the unsealing of the indictment in the US district court, Hawke argued. Hawke said that the US 4 million dollars was awarded by the Supreme Court as a quantum leap, saying that the trial judge gave no basis for how he arrived at the figure. “We say the Court of Appeal was correct to reject the award,” said Hawke. Hawke said that the trial judge went into a judicial cul de sac that he could not come out of. Hawke further stated that they accept the fact that the search was excessive, but it was not oppressive, he said. One of the judges on the panel asked him what should be the appropriate relief for that. The judge then asked him what his position was on vindicatory damages. Hawke replied that in terms of the standard and the bar, it did not cross that bar. Hawke said that from his understanding, the officers who conducted the search may have been overzealous, but the search was not oppressive.